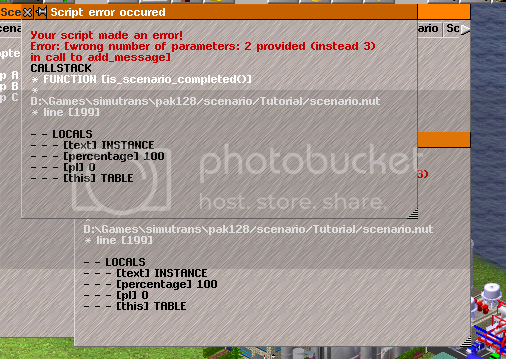 I am currently working on a Scenario Tutorial for Simutrans using Pak128. The Scenario will require the '<img > tag patch' applied to v 120.1.2 or above of Simutrans. (It will work without the <img > tag patch, however will not display properly as <img > tags will be interpreted as < i > tags, and images will not be displayed). This is intended to be included with the Steam version of Simutrans when it is released to Steam. I have currently coded 'Getting Started', and most of 'Ruling the Roads'. My reasoning for starting with Roads, as opposed to Rails is that Roads already exist in towns, so bus stops etc can be built without needing to worry about track laying, etc. Also, most Roads can be placed on "Double Height" hills. Once it is complete, I would appreciate assistance translating it. I will post versions as I progress, with the first version being posted once I have finished the Road section, to try and get feed back on how to improve the Tutorial Scenario. I'm okay to test your scenario, eventually include it directly in pak128 (if you are okay with that). A tutorial is precisely what Simutrans has needed for so long and using a scenario for this was discussed many times. It's great that someone has some time and motivation to make it, so you already deserve a big THANK YOU. So feel free to use the scenario source. It is still in process, but it is pak set free coded. Usable for chapters and more. It seems that something broke in the version released on Steam I can not advance from chapter one and no images are displayed ... (at least on linux). I've been changing a bit the tutorial scenario to make it much easier to follow, also I have the intention to add some chapters to make it look more beautiful. I've made some adjustments to the English translations. As soon as some chapters are 100% done, I'll start translating them to Dutch (my mother-tongue) and French (second language in Belgium). I had just one problem. The first thing to do, is to check whether the place where the depot is placed, there is a stretch of road. -a zip-file containing all files for the scenario. Can you upload the files to mediafire ?, I have problems with Dropbox. I have given the finishing touches at second chapter, it works great now, thanks to Dwachs. [1/6] First you must build one or more bus stops in %s city. [1/6] Primero debes colocar una o mas paradas de autobus en Ciudad %s. [2/6] Using the Roads Tool connect the two points between %s and %s. [2/6] Use la Herramienta de Carreteras para conectar los puntos entre %s y %s. [3/6] Use the Deposit Road %s to buy a new bus. [3/6] Use el Deposito de Caretera %s para comprar un nuevo autobus. [4/6] Click on Schedule and select one or more stops in %s city. [4/6] Click en Enrutar y seleccione una o mas paradas en Ciudad %s city. [5/6] Now select one or more stops in %s city. [5/6] Ahora seleccione una o mas paradas en Ciudad %s. [6/6] Select the last stop (%s) and place the Load (Min) at 100%%. [6/6] Seleccione la ultima parada (%s) y coloque la Carga (Min) en 100%%. You must leave this free road for the second bus. Debes dejar este camino libre para el segundo autobus. First you must build the 4 stops. Primero debe construir las 4 paradas. Stops should be built on a road. Las paradas deben construirse sobre una carretera. Only 4 stops are necessary. Solo son necesarias 4 paradas. First you must connect the two cities. Primero debe conectar las dos ciudades. The first vehicle has a minimum load of 100% at this stop, this restricts the passage of other vehicles. El primer vehiculo tiene una carga minima de 100% en esta parada, esto restringe el paso de otros vehiculos. These are only the corrected sentences. I'm not a native speaker so somebody might have to recheck this. [1/6] First you must build one or more bus stops in %s. [2/6] Use the Road Tool to connect the two points between %s and %s. [3/6] Use the Depot %s to buy a new bus. To what does the %s refer here? Click on <no schedule set> and select <create new line>. Then select one or more stops in %s. [5/6] Now select one or more stops in %s. You must leave this road clear for the second bus. You must build the 4 stops first. The route is complete, now you may start the vehicle from the depot. You must connect the two cities first. [1/6] First you must build one or more bus stops in %s. %s="City Name"
[2/6] Use the Road Tool to connect the two points between %s and %s. %s="Coordinates point"
[3/6] Use the Depot %s to buy a new bus. %s="Coordinates of deposit." [4/6] Click on Schedule and select one or more stops in %s city. %s="City Name"
Then select one or more stops in %s. %s="City Name"
[5/6] Now select one or more stops in %s. %s="City Name"
ok, than the %s can stay, I thought it referred to the city. @TjoekerThese are the texts of chapter 3 in Spanish. I don't speak Spanish, could you try to translate it to English? It doesn't matter if it's a bad translation, I'll correct it. It was difficult, but finally achieve complete chapter 3. Still pending translations into English because I do not have internet on my computer and I depend on google translator. hmm, I see. I can have a look tomorrow. Or is there anyone who speaks both Spanish and English, and is willing to help translating? I added the corrections, please check that all is well (may I make mistakes). I also take the opportunity to correct some errors. Hi, I'm trying the tutorial scenario (and intent to translate it to Czech). I noticed that tin chapter 2, step C, I cannot build a bus stop at (98,97) - getting message: "you must leave this road clear for second bus". What is that? I had a bit of problem to get through the CH2, step D - setting up the schedule. I got no feedback after setting the load to 100%. It did not let me continue If I set "copy backwards" - so a hint to make circular route would be nice. CH3, paso B, step 1 - build straight slope - well there is already a straight slope - there should be some explanation about double heights and the need to have full height slope at the tunnel entrance. Flat slope is IMHO nonsense - either flat tile, or half slope. The necessary slope could be built by "classic" up/down tool. Also the player could be allowed to make a cutting for the bus line in ch.2. Just to show him how it can speed up the travel. CH3 paso D, step 1 - build tram rails? Should be train rails? And then the same with electric trains..
Ch3 - building the mail line - would be nice to let players build bridges over rivers, if they want. Also hints about recommended type of road/rail/catenary/tunnel/bridge would be nice. Ch3 paso I, even though I built quite a small train (flying berliner) - it took ages to fill it to 100% as was required by script. (Maybe because I built the bus stop next to train station, so it took away many passengers). I was not wiling to wait and let the train depart without filling, but the scenario did not advance further. If there are no more tasks, it should say something. I think setting 100% load for passenger service is not a good idea - it is enough to show it at freight services. Perhaps it should also lead the player to make stop at rio de abajo on the way back. Anyway, good job looking forward for further chapters. Simply hinders the passage of the second bus. Do not use "copy backwards". This is easy to change. You can send the text files modified? (I'm not very good with English). I'll adjust the textfiles (where possible without having to alter the code). Players probably won't use 'copy backwards' as they are not told to do so. But, This gave me an idea. Why not let them make a second line, where they should use copy backwards? What about putting some curiosity (castle) half-way between the cities, and telling the player to make the first line (inside the city) circular, and the second line (inter-city) stop at the curiosity and use "copy backwards"
Good idea, Yona-TYT, what do you think? I need a little help from a native English speaker. "In this tutorial, the first steps in setting up your transportation empire in Simutrans are explained. The focus is on the necessary actions around transportation chains in Simutrans." I am currently playing the scenario to see if I made any weird mistakes in its context. But I still have this error at the end of chapter 1, step 3. The focus is on the actions necessary to build transportation chains in Simutrans. I feel like the first sentence needs some changing as well. It might grammatically be correct, it uses to many "in"s, which makes it difficult to read. I found another bug in the scenario. Sometimes I don't even get to see this step? But besides that, the text asks me to rotate the map to continue to the next step. Might not be a big deal, but can I change the text then? Or can you change the code? You can send a saved game ?. Create a new installation of simutrans using r7919 or r7920. I can't save the game if the error already occured. I can not replicate the error. @Tjoeker: Please update the game files (not only the executable) to a recent nightly. "In this tutorial, the first steps in setting up your transportation empire in Simutrans are explained. " "In this tutorial, the first steps when setting up your transportation empire in Simutrans are explained. " Maybe we can spawn some people at the first stop after a small amount of time? Do you mind if I sometimes add some text to make some things clearer? Like a little explanation here and there. There is no problem. The truth is I'm not very good at explaining things. I've fixed some bugs and applied this http://forum.simutrans.com/index.php?topic=16523.msg157450#msg157450 to make things a bit more straightforward.